Each tablet contains-Vitamins: Vitamin A[As Beta Carotene] &Vitamin A (retinol) Palmitate 5000 IU,Vitamin C 60 mg, Vitamin D 400 IU,Vitamin E 30 IU,Vitamin K 25 mcg,Thiamine 1.5 mg,Riboflavin 1.7mg, Niacin 20 mg,Pyridoxine Hydrochloride 2mg,Folic Acid 400 mcg,Cyanocobalamin 6 mcg,Biotin 30 mcg,Calcium Pantothenate 10.88 mg.
Minerals: Calcium 162 mg, Iron 18 mg,Phosphorous 109 mg,Iodine 150 mcg,Magnesium 100 mg,Zinc 15 mg,Selenium 20 mcg,Copper 2 mg, Manganese 2 mg,Chromium 120 mcg,Molybdenum 75 mcg,Potassium 80 mg, Chloride 72 mg,Boron 150 mcg, Nickel 5 mcg,Silicon 2 mg,Tin 10 mcg, Vanadium 10 mcg & Lutein 250 mcg. Vitamin A: Helps form and maintain healthy skin, eyes, teeth, gums, hair, mucous membranes and glands. Vitamin C (Ascorbic Acid): Collagen formation: without it, protocollagen does not cross- link properly, resulting in impaired wound healing. Thiamine (Vitamin B1): Aids in energy utilization from food by promoting proper carbohydrate metabolism. Calcium: Helps build and maintain strong teeth and bones. Zinc: The important antioxidant enzyme, superoxide dismutase (SOD), requires zinc, together with copper and manganese, to function. Zinc is also essential for the metabolism of vitamin A, another important antioxidant, enhance wound healing. Selenium: Role as an antioxidant in the enzyme selenium-glutathione-peroxidase. Boron: Boron affects calcium, magnesium, and phosphorus balance and the mineral movement and make up of the bones by regulating the hormones, mainly parathyroid that control these functions. Silicon: May be necessary for normal cartilage, collagen and bone formation. Silicon promotes firmness and strength in the tissues. Tin: Necessary for normal growth & Cell metabolism. Vanadium: Pharmacological studies in animals suggest that vanadium may be involved in hormone, glucose, fat, bone and tooth metabolism as well as reproduction and growth. Lutein: Super antioxidant that provides protection against free radicals. 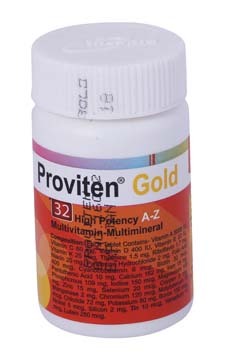 Proviten A-Z is recommended in pregnancy and lactation.